A little over four years ago GM factories stopped producing the last of over a hundred years of Oldsmobiles. Indeed 2004 was a sad year; it was the departure of what was once the golden division of General Motors. Though it was a sad day it was not a surprise, Oldsmobile since the late 1980s was like a patient with terminal cancer. Year-by-year Oldsmobile withered away in the 1990s until its eventual demise. In 1897 Ransom Olds in Lansing, Michigan founded the Olds Motor Vehicle Company. The name a few years later was shortened to Oldsmobile. In 1908 the recently formed GM (General Motors) bought Oldsmobile. It was the start of a marriage that would be beneficial for both parties for many years to come. Under the leadership of GM, Oldsmobile thrived. By the 1930s, Oldsmobile’s famous use of the two-digit numbering system to differentiate its different model offerings had begun. The first digit was the body size and the second digit was the number of cylinders in the engine. Born out of this system were two of Oldsmobile’s bread and butter cars; the 88 and 98 which remained in production until the 1990s. However it was not until after WWII (World War II) that Olds would flourish and see it’s best years. 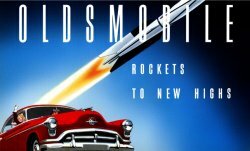 Oldsmobile always on the cutting edge of innovation, released during the 1940s two new items that would become the cornerstone of American cars for many years. First was the release in 1940 of the first fully automatic transmission called the Hydramatic. The other was the OHV (Overhead Valve) V8, which was released for the 1949 model year. Cadillac also released an OHV V8 that same year. However the Oldsmobile motor, a 303 CID V8, received most of the attention. In fact many historians credit Oldsmobile for creating the roots of the muscle car era since it’s OHV V8 nicknamed the “Rocket V8” soon caused the emergence of copycat performance oriented OHV V8s from every other US automaker. Before the OHV V8 the only V8 available was the flathead which was an inferior design that could have never fueled the muscle car revolution in the 1960s. And it could have never fueled the explosion of big (OHV) V8 powered American family cars that cropped up everywhere by the late 1950s and were the mainstay on America’s roads until the late 1970s. The OHV V8 had done to the auto industry what Guttenberg’s printing press had done for books; it was nothing short of a revolution. By the 1950s the Oldsmobile 88 became a stable of what a comfortable upscale family car should be. Sales were very good. There was also the 98, the top-of-the-line Oldsmobile which to most buyers only seemed a slight step down from a Cadillac. Oldsmobile had found its niche, by offering powerful family cars with many luxuries that an average middle class family could afford. By the 1960s with sales in a constant climb and a whole range of exciting and innovative models such as “the way ahead of its time” front-wheel drive Toronado, it seemed the good times would never end. 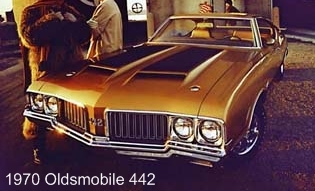 Oldsmobile even forged a nice niche in the muscle car market by offering the 442 based on its intermediate Cutlass line. The 442 soon was the muscle car of choice for performance oriented buyers who wanted a plethora of luxury and convenience options. During these years the 98 also continued to go more upscale and was almost becoming a Cadillac equal. This trend continued into the 1970s. Even the 88 and 98 names went upscale and were now being called the Delta-88 and Ninety-Eight by this time. 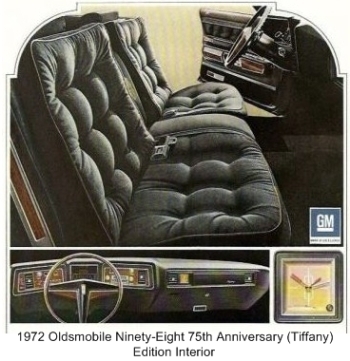 Proving that it was not going to play second fiddle to Lincoln and even Cadillac, Oldsmobile released the ultimate in luxury; the 1972 75th Anniversary Edition Ninety-Eight, often referred to as the Tiffany Ninety-Eight. The Tiffany Ninety-Eight was nicely done with luxury touches by Tiffany’s (the world famous store). The Tiffany gold exterior paint scheme and a Tiffany designed dash clock were among some of the Tiffany luxury touches. Placing this Ninety-Eight next to the top-of-the-line 1972 Cadillac Fleetwood would have many pointing to the Ninety-Eight as the superior luxury car. This was indeed the pinnacle for Oldsmobile. By this time Olds had two V8 engines powering its vehicles. First was the mighty big-block Rocket 455 CID V8 that had enough torque to uproot an hundred year old oak tree. Then there was the powerful small-block Olds 350 CID V8, which had become a popular engine among the smaller Oldsmobiles. With sales strong and Oldsmobile at the top of its game, suddenly 1973 came. It was the year of the first Energy Crises, which had gasoline prices soaring. All of a sudden, Oldsmobile a luxury brand with large plush cars with thirsty V8s, was seeing its sales drop. Oldsmobile kicked into gear and began to change direction. It would continue to offer luxury cars but in more efficient packages. With the arrival of the Chevrolet Nova based Omega to the Olds lineup and the shrunken 1977 Ninety-Eight and Delta-88, Olds was on its way down a new path. The new shrunken 1977 Ninety-Eight and Delta 88 were big hits. The luxury was just as plush as ever especially on the Ninety-Eight and smooth-accelerating V8s were still available. The standard engine in the Ninety-Eight was a variant of the small block Olds 350 – the Olds 403 CID V8. Oldsmobile still had the competition beat with the 403 (185 horsepower and 325 lbs/ft torque); a fuel efficient large displacement V8 with big block torque. It was certainly the best of both worlds. It seemed Oldsmobile was going to weather the storm with ease. However by the late-1970s the new C.A.F.E. (Corporate Average Fuel Economy) standards were being rolled out which spelled the end of the 403 V8 (1979 would be its last year), and the Olds 350. By the early 1980s all that was left was the small-block Olds 307 CID V8 for Oldsmobile customers who wanted (non-diesel) Olds V8 power. Also worthy to note around this time period GM was sliding motors from different divisions into some of its cars. For instance a Buick V6 could be found during this time in some Oldsmobiles. GM received a lot of flack along with lawsuits for this policy since it was a given for many years when you bought an Oldsmobile you got a Oldsmobile motor, if you bought a Pontiac you got a Pontiac motor, etc. And speaking of motors it was also during this time when the notorious Olds 350 CID V8 Diesel was released. At the time it seemed like a smart idea however it was plagued with so many problems; even to this day this diesel motor is looked upon as one the biggest engine flops in automotive history. One big bright spot for Olds back in the late-1970s and early 1980s was the Cutlass, its rear-wheel drive intermediate car and the best selling car in America. Oldsmobile had forged a new niche by providing luxury in a sporty package for a reasonable price. Oldsmobile showrooms during this time were always crowded with buyers. However a very bad trend was rearing its head at Oldsmobile – the arrival of new front-wheel drive models. By the early 1980s the Omega was now front-wheel drive and for all intents and purposes an econo-car with Oldsmobile badges. In 1982 a small front-wheel drive J-body called the Firenza joined the Olds lineup. That same year a new mid-sized front-wheel drive A-body Cutlass Ciera also arrived. Unfortunately buyers weren’t really taking to these new front-wheel drive Oldsmobles. They were passing them over and going right to remaining bigger rear-wheel drive Oldsmobiles. This could only go on for so long. The Cutlass Ciera though not a bad seller was not a sales leader, its GM A-body brother the Chevrolet Celebrity outsold it by a very large margin. By 1984 Oldsmobile still was doing well and its future still seemed bright and it appeared Oldsmobile could survive with a mix of rear-wheel drive and front-wheel drive cars. However the line was crossed in 1985. This was the model year Oldsmobile rolled out a new extremely shrunken front-wheel drive Ninety-Eight. For the first time in it’s history the Ninety-Eight would not have a V8 under it’s hood, only a Buick built fuel injected 3.8 liter V6 (150 horsepower) was available. On the inside it was luxurious but on the outside it was uninspiring. For the first time most buyers could not tell the difference between a Buick Electra and a Ninety Eight. Both were victims of Roger Smith’s (former GM President and of Michael Moore’s movie Roger and Me fame) cookie cutter car program which was supposed to save the Big General millions but ended up throwing away sales to its competitors. The new Ninety Eight at a very short 196.6 inches was only a few inches longer than the much less expensive Cutlass Ciera. It was a hard pill for the traditional Ninety-Eight buyer to swallow since a well optioned 1985 Ninety-Eight was in the $20K range and this was back when the average car was about half that price. 1985 would also see the release of a new N-body front-wheel drive Calais to replace the unpopular Omega. 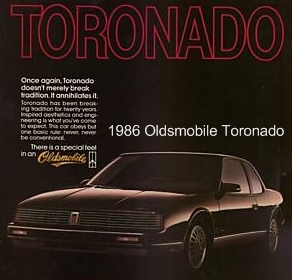 If you think 1985 was a bad year, 1986 would prove to be even worse for Oldsmobile. The Delta-88 which had held out as long as it could in rear-wheel drive form, became a virtual front-wheel drive Ninety-Eight clone. The cars were so similar only the Ninety-Eight’s more upscale interior helped some to see the difference between the two cars. However Olds still produced the rear-wheel drive Custom Cruiser wagon which was based on the former rear-wheel drive Delta-88 platform. Oddly enough the Custom Cruiser wagon which was built in the same factory as the rear-wheel drive Chevrolet Caprice, would survive through the 1992 model year (it had a redesign along with the Caprice wagon in 1991). The Toronado a solid midsize car though front wheel drive it was a decent sized car by 1980s standards got shrunk worse than the kids from the Honey I Shrunk the Kids movie. The Toronado had lost almost two feet in length and was only 187.5” long. Visually it looked very similar to an inexpensive 1986 Oldsmobile Calais which was only a few inches shorter. The Toronado like the Ninety-Eight was in the $20K range and was competing with cars like the Lincoln Mark VII which was about 15 inches longer. The only bright spot by this time was the rear-wheel drive 2-door and 4-door Cutlass Supreme however like someone hanging from the Empire State Building by a fingernail, it was living on borrowed time. Though the Cutlass Supreme still sold well GM had decided its days were numbered. The rear-wheel drive Cutlass Supreme would hang on through the first part of the 1988 model year and then was laid to rest. There was a resurgence of the Hurst/Olds (a performance special edition Cutlass from the late-1960s and 1970s) for 1983 and 1984, along with a 1985-1987 442. All were performance packages on the Cutlass Supreme and powered by a 180 horsepower High-Output 307 CID 4bbl V8 (170 horsepower for 1987). From the 1980 introduction of the front-wheel drive Omega to the death of the rear-wheel drive Cutlass Supreme in 1988, in eight short years Oldsmobile had been so drastically changed. The traditional Oldsmobile buyer who had come back to an Olds dealer in 1988 to buy a new Olds would have thought he had awoken in a terrible nightmare or somehow stumbled into the twilight zone. What was left by 1988 at Oldsmobile was an odd collection of uninspiring over-priced front-wheel drive cars (barring the Custom Cruiser wagon). Roger Smith’s front-wheel drive cookie cutter strategy had failed miserably. Olds spent the 1990s trying to reinvent itself realizing it had alienated its former customer base and that the only way to survive was finding new customers. They tried changing the Oldsmobile logo to a modern space-age design, changing the names of their cars, marketed the Oldsmobile as the upscale Saturn division, and even introduced an Olds SUV. None of this worked, and by 2004 GM pulled the plug on Oldsmobile. Could this have been avoided? I believe it could have been. Though GM had its back up against the wall with the C.A.F.E. standards, it should have never allowed its full-size lineup to go to front-wheel drive during the mid-1980s. GM should have kept both its full-size cars and its G-body platform (Cutlass Supreme) rear-wheel drive. Then it would have been able to give Oldsmobile customers a rear-wheel drive Olds Ninety-Eight, Delta 88, and a smaller rear-wheel drive 2-door and 4-door Cutlass Supreme. Essentially this is what Cadillac has done in recent years with its full-size STS and mid-size CTS both of which are rear-wheel drive and based on GM’s new Sigma platform. This rear-wheel drive platform template if implemented back in the mid-1980s for Cadillac, Oldsmobile, and Buick would have prevented the General’s big market share loss the last 20 years. The Roger Smith cookie cutter front-wheel drive cars are responsible for the loss of individual identity among all the different GM divisions. Don’t get me wrong GM was smart going to front-wheel drive on its small and some of its intermediate cars however on the higher-end brands like Cadillac, Oldsmobile, and Buick the intermediates and full-size should have stayed rear-wheel drive as previously mentioned. It was a sad testament to General Motors when back in the late-1990s its only rear-wheel drive cars were the Corvette, Firebird, and Camaro.